For busy organizers like you, preparing for attendees’ name badges may look like an insignificant detail that requires you to spend extra time and effort during your busiest times. You may have to design a fully branded badge, make sure that the name on every badge fits in the layout, and then allow a few weeks for ordering, printing and delivery. It’s time-consuming, inconvenient and still worrisome due to unexpected delays or mistakes! It doesn’t need to be so painful anymore. Whova released a powerful yet easy-to-use self-serve name badge preparation tool. 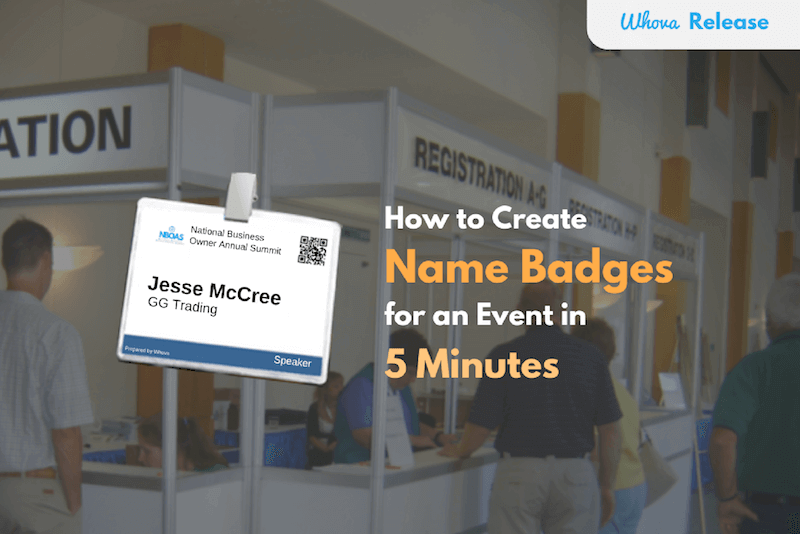 You can create, print, and be ready to use high-end, professional-looking, full branded badges for hundreds and thousands of attendees in only 5 minutes. It is available for FREE for Whova customers as a part of Whova all-in-one event management solution. You don’t need to spend extra money and time. We were pleasantly surprised, as the entire process was seamless. Our event attendees, vendors and speakers all loved and complimented us on the app. We also used the app to make our badges and QR codes for check-in, which saved time and money! Whova is made for busy organizers to set up and manage all event data and utilities in one place. 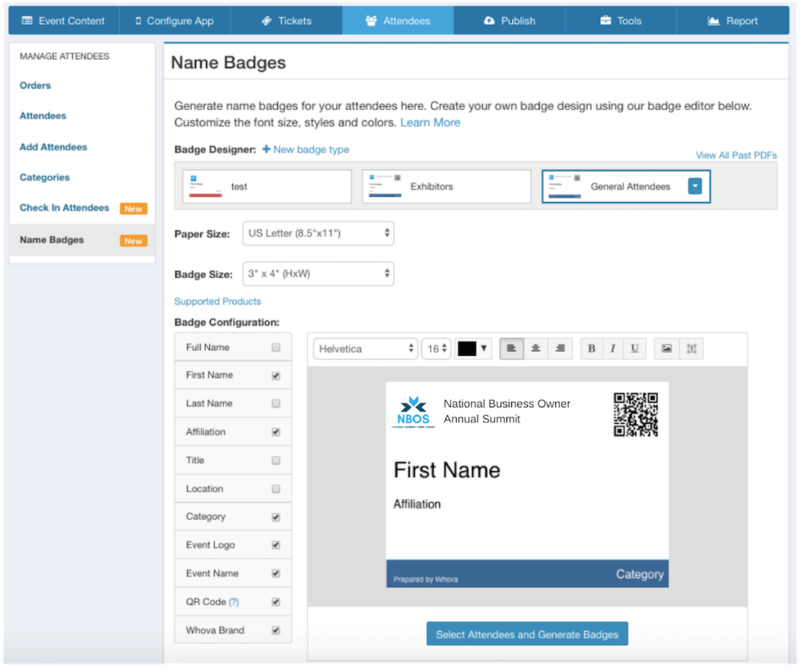 If you already set up the online registration, mobile event app, or on-site guest check-in through Whova, all the information you need for name badges (attendee names, affiliations, types, interests, QR codes, and an event logo/name) is already in the Whova Event Management System (EMS). With the information, Whova already designed name badges for you – you just need to review the badges and send them to your printer. You don’t need to place an order to a 3rd party name badge printing service. No need to worry about a few weeks of the turnaround time, printing quality or possible errors, last-minute registrants whom you didn’t order badges for. You can use Whova to print badges out by yourself one or two days before the event, or even during the event. Be in control of everything to avoid unnecessary stress. Some registration services offer a tool to print name badges but they only provide a generic template without any customization option. However, Whova’s default template is already designed with your event name and logo as the Whova EMS already has the information. Each name badge is also personalized based on each attendee’s QR code, attendee type (e.g. speakers, sponsors), etc. If you have 3 minutes, you can further custom the font, color, badge size, and content positions in the best way for your event branding. Otherwise, just go with the default one we designed for you – still very nice and neat! Some attendee’s or affiliation’s name can be too long to fit in the design that works nicely for the majority badges. It is neither easy to notice such a format issue with a few badges at a glance or simple to fix them. Adjusting the template design may affect all other badges; manually working on those problematic badges is time-consuming and tedious. With Whova, you don’t have to fix errors manually. It will automatically detect problematic badges and resize the fonts only for those ones, which will save your time and efforts. No worries about walk-in attendees. You can separately print their badges onsite. It covers various sizes of papers and badges (Avery), so it will work with your badge printer. Regardless how many badges you need to prepare, you can conveniently prepare such nice name badges for free. As a part of the Whova all-in-one event management solution, the self-serve name badge preparation tool is available at free of charge for our customers using the Whova event app and/or Whova registration! Here request more information. If you are in rush, simply use the branded design Whova prepared for you. Or, you can easily customize the design and adjust the badge size. 1-click will generate a PDF file including all the badges. You can preview, download, and print it out with Avery. No worries about format errors. Whova will automatically shrink the fonts only on those problematic badges. After printing the badges, cut and insert them into name badge holders. You can print badges on demand at the registration desk. 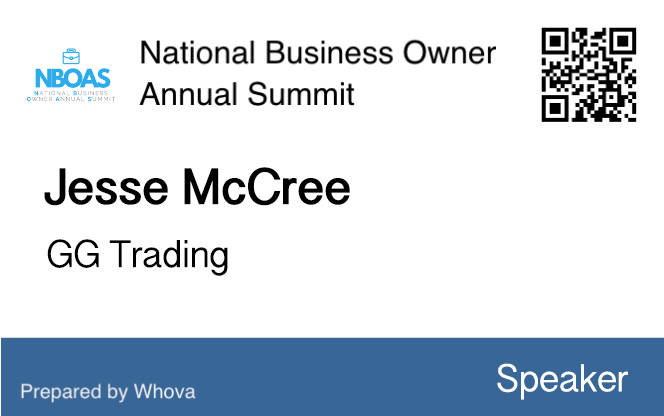 If you use Whova’s all-in-one event management solution including the Whova event app and Whova registration/ticketing, you can enjoy many useful tools at free of charge, including the self-serve name badge preparation tool, onsite check-in, live polling, event wall displaying event activities on a large screen, gamification, and many more. Contact us at hello@whova.com or request more information.